Lovecraft’s Great Old Ones can often look a bit silly. Not this one – this would give any Shoggoth a run for its money. 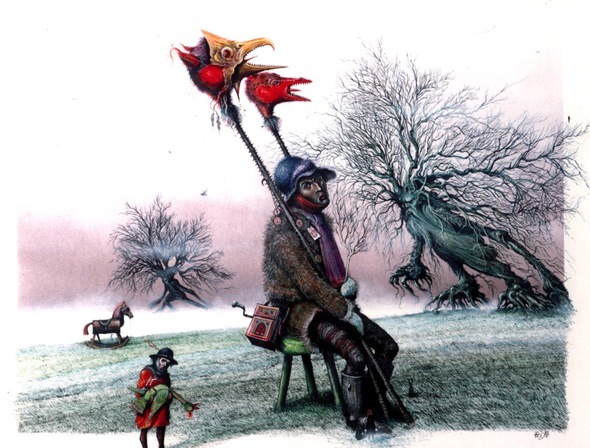 The early 1970s saw a renaissance in Science Fiction and Fantasy cover art in the UK, led by New English Library and Panther. If you compare the drab covers of the 60s with what came after the difference is striking. Gone are the clumsy Pop Art/Op Art photo collages and instead the shelves of W. H. Smiths were filled with the gorgeous colours of Bruce Pennington, the meticulous figure work of Jim Burns, Foss’s vast spaceships and the insane acid dreams of Bob Haberfield‘s covers to Mayflower’s Moorcock books. As the decade progressed, and each artist spawned their own imitators (particularly Foss) then a certain feeling of sameness started to creep in, which only made the illustrator with a unique style stand out even more. 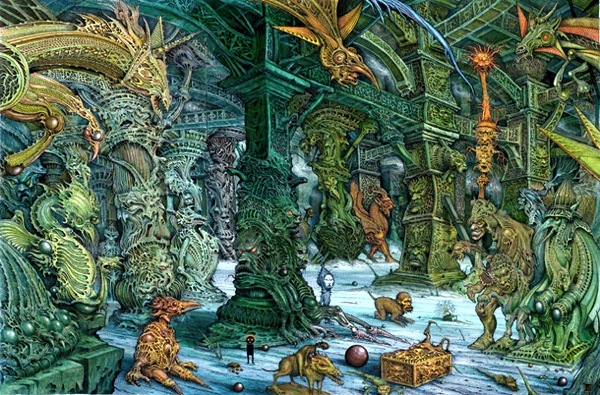 One such artist was Ian Miller, whose incredibly detailed and frenetic drawings started to appear on the covers of fantasy and science fiction novels from 1973 onwards. By the time Science Fiction Monthly interviewed him in 1975 he’d produced a small but startling selection of illustrations for Panther (Lovecraft’s At the Mountains of Madness and The Haunter of the Dark) and Pan (including Ray Bradbury’s S is for Space). His art was about as far away from the brightly coloured planets and spaceships of his contemporaries as you could get. Instead he produced incredibly detailed almost monochrome images that were reminiscent of the work of renaissance artists like Albrecht Dürer (1471 – 1528) and Hieronymous Bosch (1450 – 1516). 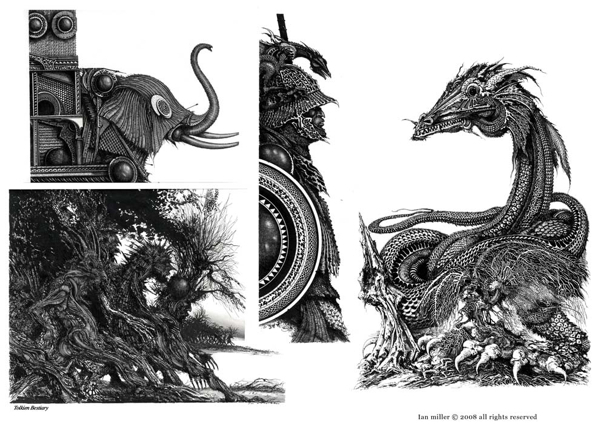 The first impression on looking at Ian Miller’s work is that these are the nightmares of someone who has gone completely mad. In his pictures disturbing machine/insect/plant hybrids loom over human figures, set against monochrome or flat colour landscapes devoid of any real perspective. The humans often wear landsknecht armour, and have the same childishly vacant expressions you see on early Renaissance saints or Russian icons. The demons and monsters are truly hideous creatures straight out of Bosch. Often Miller drops in a musical box or a rocking horse or two into his apocalyptic scenes, where they take on a sinister, grotesque power. As is often the case with Grotesque and Symbolist art, you get the impression they are supposed to represent something else, but god knows what, and that makes them all the more frightening. Interestingly in his interview in SFM Miller suggested an interest in Jungian theories of archetypal symbols popping up throughout human consciousness over the ages, but where a rocking horse fits into that I’ve no idea. You get the sense that he and the interviewer are over-egging the pudding a bit, and that Miller just puts stuff like this into his pictures because it looks very scary and weird. 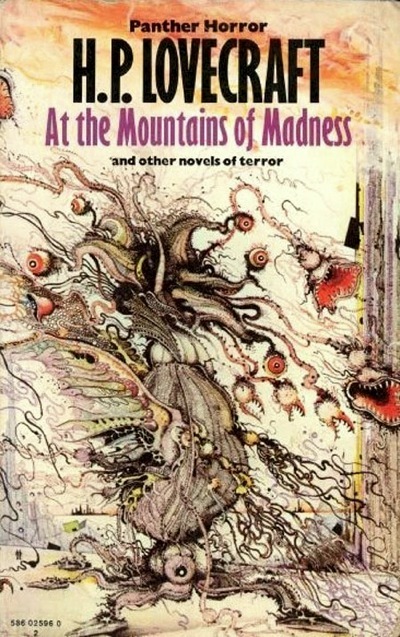 Despite trying to move into SF covers, Miller’s work was clearly a far better fit for Science Fantasy and Horror. He really came into his own working on Games Workshop’s Warhammer series, and did some truly wonderful illustrations for the Warhammer role-playing game book and supplements published in the 1980s. In many ways his art outshone the game itself, capturing the atmosphere of a darkly insane parallel Renaissance world to a far greater extent than the often childish content. From the graphic novel The City. King’s Cross underground marginally different from what it is today. 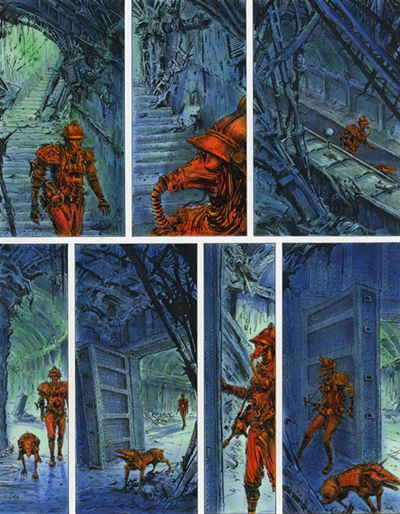 He also produced a graphic novel with James Herbert, The City, (1993), which portrayed a journey into a post-apocalyptic London dominated by mutant rats. The story is a bit predictable, but the artwork is both utterly absorbing and creepy – not the kind of comic you want to read late at night on your own. Ian Miller is still going strong as an artist, and he’s now producing some wonderfully minimalist, and just as disturbing, images for his blog. You can also browse his portfolio of earlier works, and buy prints, including some of his fantastic illustrations to Mervyn Peake’s Gormenghast trilogy. In the Night. 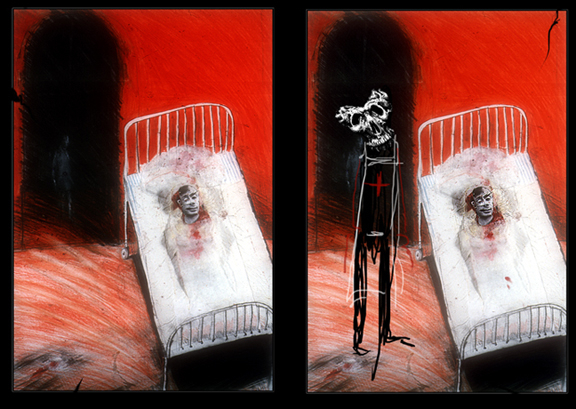 From Ian Miller’s blog. Thanks for this post, John. What a tremendous artist, not simply illustrator! Very reminiscent of the Durer, Bosch, Breugel for that touch of the grotesque bordering on insanity. Miller’s blog is well worth the visit. And he contributed to the great Tolkien Bestiary. That’s how I best remember him. From memory he did some great pictures in there. You’re right – his illustrations were great, a nicely creepy alternative to the sometimes twee imagery that Tolkein attracts. I’ve added some examples to the post above. Thanks for your kind observations regarding my work. Your comments are very much appreciated. As a point of interest, Titan Books are bringing out an anthology of my art work next May if the world does not freeze over in the interim.